Agus is not only a famous and big talented Balinese hand reader.But he is also a strong soul reader,in dept full body reader, natural healer,trustworthy life counselor and an herbalist His gift was passed from his grandmother to him when he was 10 years of age. 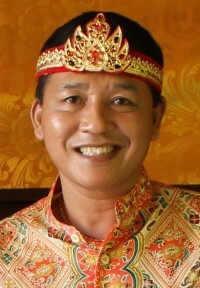 As he moved into his late teenage years, his power was increased under the guidance of Guru elders who taught him how to access his power in unique ,specific and different ways.One of his special and unique knowledge come from an ancient spiritual almost 1000 years old.Though out this spiritual learning, Agus continued to excel at his school studies. He went on to work as a tour guide and speaks fluent English and Dutch. Since then, and now for many years, Agus has been in his full power and conducts private hand readings,full body readings,aura cleansing and ceremonies at his very colourful and peacefull family home near Ubud. Regardless of your age or nationality you will feel an instant comfortable, in Agus’s presence because of his friendly and open nature.